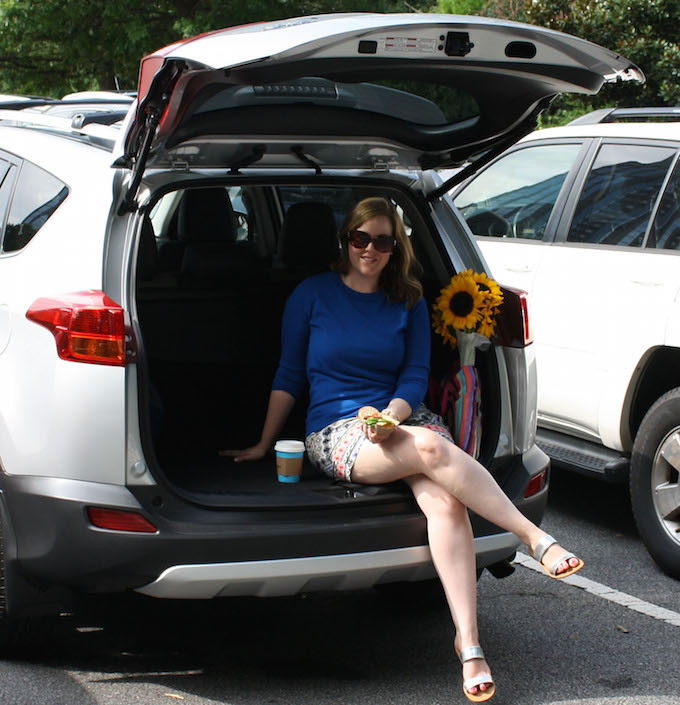 A few weeks ago, Hunter and I had a fabulous staycation in Atlanta with Southeast Toyota and a 2015 Toyota RAV4. We had a great time hitting up a few of our favorite local haunts and spending the weekend actually with each other. So often we are each doing our own thing, or simply running errands before Monday comes, that we don't actually do anything together...and let's not talk about how much technology gets in the way. For this staycation, we put our technology aside (minus my camera), and embarked on quite the summer adventure in our beautiful hometown. On Friday night, we zipped over to South City Kitchen Vinings for a fabulous meal in a comforting setting. You can read all about our meal here, and it's safe to say that dining at SCK Vinings was a great start to our staycation. After stuffing ourselves silly, we hopped back into the Toyota RAV4 and popped over to Atlanta's Fernbank Museum for Martini's & IMAX. Of course along the way, we had to get a few tunes in with the RAV4's top-notch entertainment system. I was the DD that night, so no martinis for me, but we had a blast visiting one of the largest dinosaurs in the country before settling down in the IMAX theater to enjoy the movie, Robots. Martinis and IMAX is a regular Fernbank event every Friday night, so if you find yourself in the Atlanta area, definitely add it to your agenda for date night! It was inexpensive, fun, and something we had never done before! Late Friday night at the museum quickly turned into early Saturday morning at the farmer's market. The Peachtree Road Farmer's Market is right up the road from our house. In fact, we could probably walk, but why walk when you know for sure you're going to need that spacious RAV4 trunk for all of your purchases? We walked from stand to stand perusing all of the glorious late-summer vegetables and picked up everything we needed for a garden salad and homemade pasta meal at home for Sunday. Before we left, we made sure to grab a breakfast sandwich from our favorite breakfast booth, Farm Burger. We loaded our goods in the trunk and used the bed of the trunk for a little intimate breakfast table for two. The sunflowers from the farmer's market proved to be just the little bit of ambiance we needed. 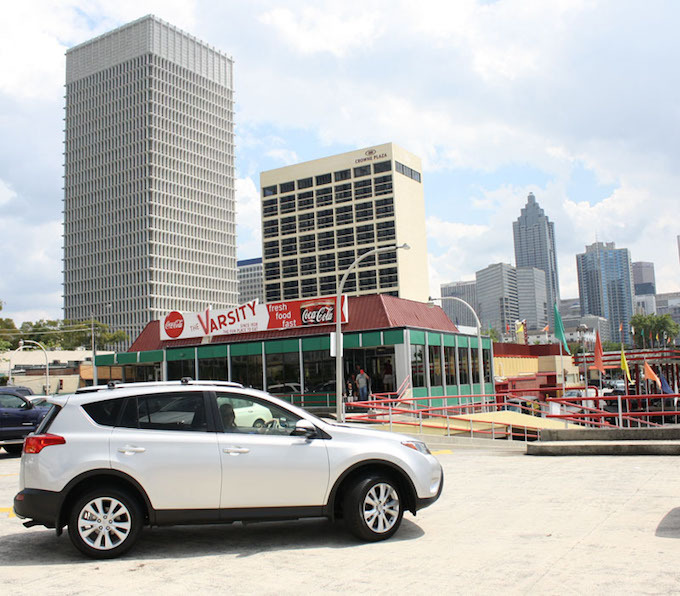 After heading home from the market and unloading all of our purchases...and a quick nap...we piled back into the RAV4 for a truly Atlanta experience: a trip to The Varsity! 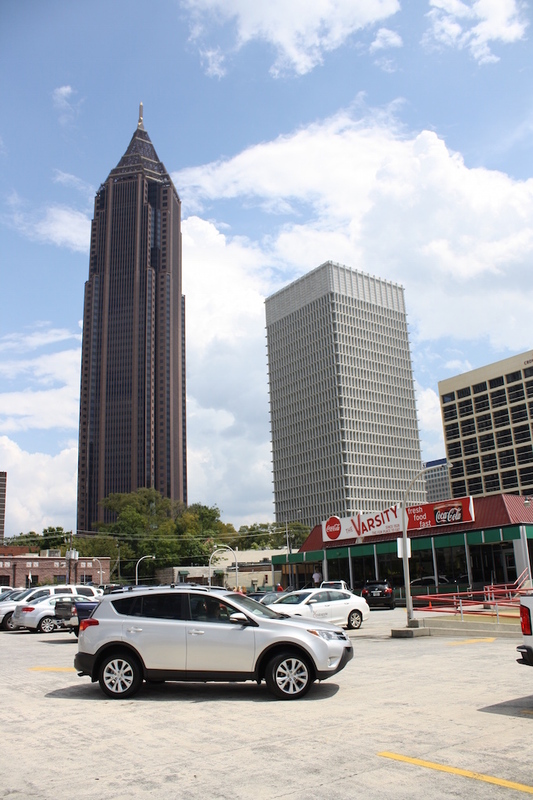 The Varsity has been in business since 1928 and is an Atlanta institution. It is the world's largest drive-in and is best known for the sweet men in red hats who take your order. Just be ready when they ask you their famous question, "What'll ya have? What'll ya have? What'll ya have?" Oh, and make sure to have cash, too! It's a cash-only kind of place. We had so much fun adding a tray to the power window of the Toyota RAV4 and using it as a makeshift table. The Varsity is an Atlanta must-visit! Since we were pretty full with a ton of yummy, greasy food, we decided we should take a walk to "burn off some calories." 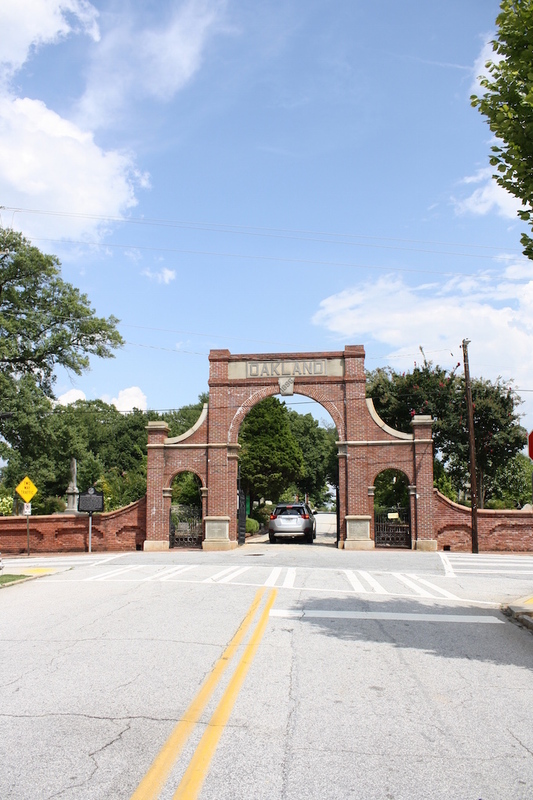 One of my favorite spots to walk in Atlanta is Oakland Cemetery. So, from one historical landmark to another, off we went. I know it might sound weird to visit a cemetery for fun, but I've always loved exploring the history of old cemeteries, and Oakland is definitely one of the best places to do just that. The best part is that you can drive into the cemetery and park wherever you're curious to explore which is great because the cemetery covers a lot of ground! I love to visit year-round, but if you have to choose a specific time, the best weeks to visit are in October. Sunday always leans itself to being just a little bit lazy, but we were excited to finish up our staycation strong. First stop: brunch at DBA BBQ. DBA just started service their brunch menu recently, and y'all, it is to die for. I'll have more on it later this week, so stay tuned! Finally, our weekend was complete after a trip to the dog park with our best girl, Ryan. Ryan is the sweetest pup, and we take advantage of our big yard often, but rarely take her to a greenspace for some real roaming. 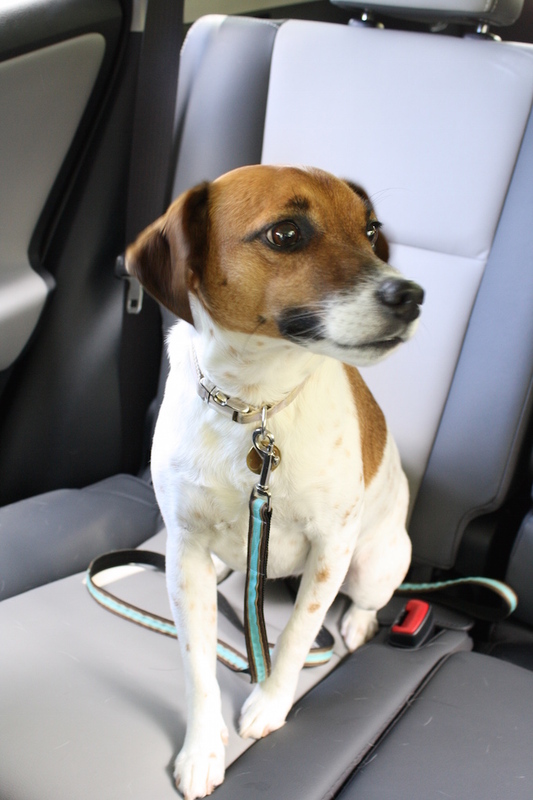 She loved the trip to the park because of the RAV4's spacious, two-toned back seats. They were comfortable for her, and she soon found her favorite spot right behind the passenger seat. If you ever get an opportunity to plan your own staycation in your own city, definitely do it! It's so much fun to take advantage of what your hometown has to offer and is a great way to get reacquainted with your favorite places. Southeast Toyota Distributors, LLC (“Toyota”) provided me with compensation and use of a RAV4 for a short period of time. The opinions I have shared about this vehicle are my own. I LOVE your Rav4 excursion! 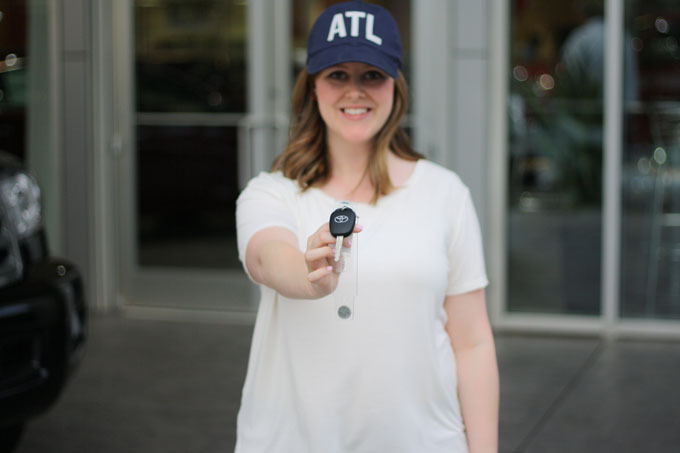 You did such an amazing job capturing the spirit of Atlanta and the car! I want one! !